Now that the majority of my shopping is finished, and the decorations hung, I get to turn my attention to one of my favorite things about the holidays: food, of course. I've been known to break the cardinal rule about cooking for the holidays, which is "cook what you know." Instead, I like to use the holidays as a time to experiment a little--usually with fancy cuts of meat or dishes that require long cooking times; things that I wouldn't bother attempting if it weren't a special occasion. Since my holiday guests are my husband, my kids, and my parents, I have a pretty forgiving audience if one of my experiments flops. Last year I attempted short ribs for the main meal, and while they weren't bad, they weren't amazing either. This year, I'm still up in the air about what I will serve for the main course. 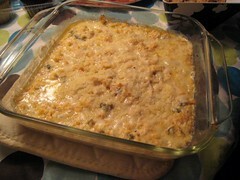 But one thing I am absolutely sure about is that my Christmas Eve jalapeno crab dip will be in the oven the night before. OK, so it's not really mine...it's Emeril's. But I've made it so often it feels like mine. Since this dip is pretty decadent, and pretty expensive to make (especially if you buy lump crabmeat from the seafood counter instead of the canned fish aisle), I only make this on Christmas Eve, which just adds to the specialness. The thing that's a bummer is that my daughter can't eat it, so eventually I'm going to have to come up with a new Christmas Eve tradition that's dairy- and shellfish-free. But for as long as she's perfectly happy with a candy cane and a gingerbread cookie, I will continue serving up this cheesy, spicy deliciousness. Preheat the oven to 350 degrees F. Combine the crabmeat, garlic, jalapenos, Monterey Jack, Worcestershire, hot sauce, salt, and mayonnaise in a medium-size mixing bowl. Toss gently to mix. Spoon the mixture into a medium-size baking dish. Sprinkle the parmesan cheese evenly on the top of the crabmeat mixture. Bake until golden brown and bubbly, about 25 minutes. Remove from the oven and let sit for about 5 minutes. Serve atop slices of fresh, crusty bread. YUM!! Will be trying this dip as we loved the Buffalo Chicken dip. I don't like jalapenos, but otherwise it sounds delicious.